The finest patterns of terracotta panels can be found in Bengal towns of Murshidabad, Birbhaum, Jessore, Hooghly and Digha. The theme is generally folk and the patterns are fairly highlighted with traditional skill and explicit artwork. The clay used is generally a blend of two to three clays found in river beds, pits and ditches. More often than not the fuel used is one of the local resources available in the form of twigs, dry leaves or firewood. The kilns where the clay pots are baked are operated at temperatures between 700 ? 800 degrees celcius. The womenfolk in the khumbkar families are the potters who work on the wheels making the round necks and the upper halves of the pots. They also make solid clay toys and dolls which are cast in burnt clay moulds. Large figurines of gods and goddesses are also made in clay and generate a lot of income for these families. 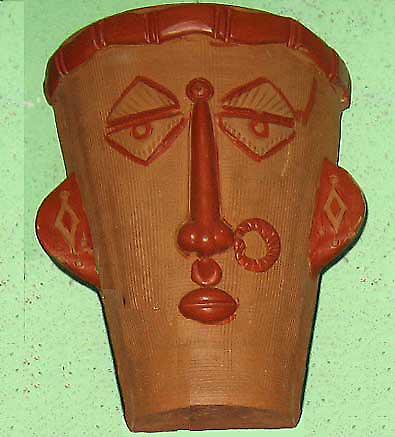 Terracotta, which is found mainly in rural parts of West Bengal, has found inroads into mainstream lifestyle with many household using the suraii, a clay pitcher used to keep water cool. Most rural households use terracotta feeding bins for cattle, tea mugs, clay pots for cooking rice, plates, tumblers, yoghurt pots. Most of the items though are of the use and throw variety.